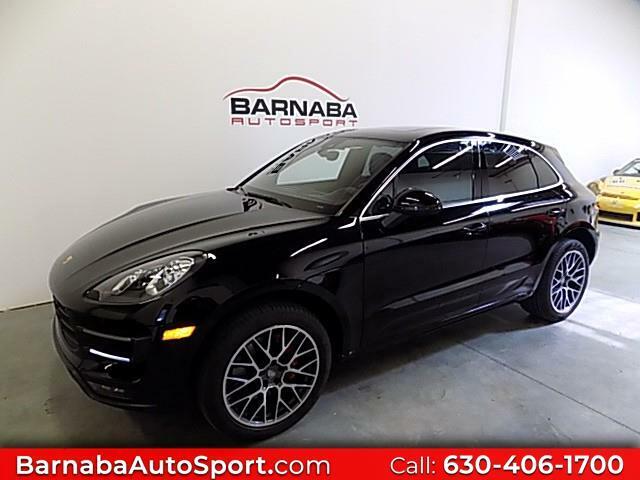 Barnaba Autosport is proud to present the arrival of this beautiful Porsche Macan Turbo. Finished in Brilliant Black over Black leather, This Macan Turbo has only been driven by ONE previous owner 24,236 miles and it of course has a clean CarFax report. Expertly serviced in our shop it is in outstanding condition throughout. The Macan Turbo is covered by a Porsche Warranty through May of 2020 with additional warranty available through 2023. In addition to its vast array of standard equipment, this Macan Turbo has been specified with fine options including Premium Package Plus, ParkAssist Front and Rear with Reversing Camera, 20 inch RS Spyder Design Wheels, 18-Way Adaptive Sport Seats with Memory Package,Trailer Hitch and Leather Package in Black. Lighter, more agile, and more car-like than the Cayenne Turbo, the Macan is a Porsche in every way. A fantastic turbocharged V6 engine with 400HP is both powerful and efficient at the same time. Power is routed through Porsche's famed PDK 7-Speed Dual-Clutch Transmission and provides comfortable shifting in Automatic mode, or very sporty shifts in Manual mode. Plenty of room for a family's next vacation, and plenty of style for an evening out! Message: Thought you might be interested in this 2016 Porsche Macan.